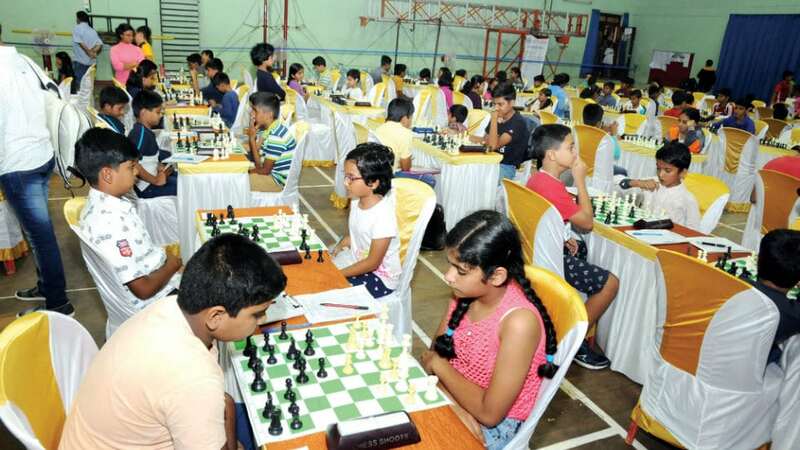 The All India Under-15 FIDE Rated Open Chess Tournament-2018, conducted by the Mysore Chess Club under the aegis of the United Karnataka Chess Association (UKCA) & All India Chess Federation (AICF), began at the University Gymnasium Hall here this morning. Dr. M.R. Jayaram, Chairman, Gokula Education Foundation, Bengaluru, inaugurated the Tourney in the presence of Ramesh, Dy. Director, DYES, Bengaluru, K. Jyothi, CEO, Zilla Panchayat, Mysuru, H.G. Srivara, Hon. President, Mysore Chess Club and K.G. Jayaprakash, Hon. Secretary, Mysore Chess Club, M. Nagendra, Vice-President, UKCA and Sudharshan, President, MDCA. During the inaugural, Karnataka’s first Grand Master M.S. Thejkumar was felicitated by the organisers. Around 320 players from across the country are taking part in the tournament which is being conducted for the first time in Mysuru for the U-15 age category. A total of nine rounds will be played in the Swiss League format. Top players like V. Pranav (Tamil Nadu), Keshav Kothari (Karnataka), Arhan Anand (Karnataka), M.Rajam (Tamil Nadu), Tamil Selvi (Tamil Nadu), Raghul Sarin (Tamil Nadu), Kalki Eshwar (Karnataka) and Chaitnya Ganesh (Karnataka) are taking part in the Tourney which will conclude on Nov.25.